Mega Sale! 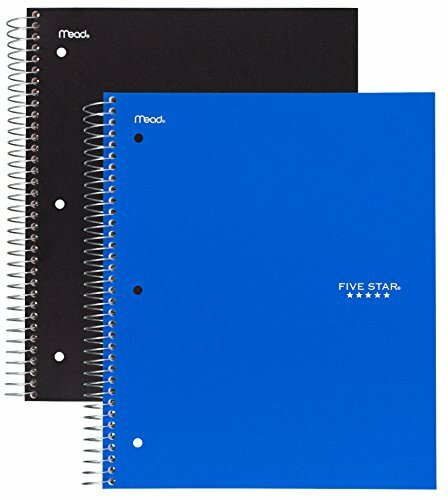 Save 21% on the Five Star Spiral Notebooks, 3 Subject, Wide Ruled Paper, 150 Sheets, 10-1/2'' x 8'', Black, Blue, 2 Pack (73033) by Five Star at LDP Graphic Design. MPN: 73033. Hurry! Limited time offer. Offer valid only while supplies last. Lasts All Year. Guaranteed! * Keep notes organized and secure in this durable, 3 subject, wide ruled, 150 sheets, 3 hole punched, wirebound notebook. Lasts All Year. Guaranteed! * Keep notes organized and secure in this durable, 3 subject, wide ruled, 150 sheets, 3 hole punched, wirebound notebook. Water resistant covers protect them, and reinforced storage pockets help prevent tears. High quality paper resists ink bleed; 10.5 x 8 inch tear-out sheet size. Spiral Lock wire helps prevent coil snags, and Neat Sheet perforated pages easily tear out. One Black and one Cobalt Blue notebook per 2 pack. 10.5 x 9.5 x 1 inches overall. *ACCO Brands will replace any Five Star notebook that is returned within one year from the date of purchase. The guarantee does not cover damage due to abuse. Contact ACCO Brands Consumer Affairs for instructions.